Nancy at Spirit Lights the way tempted my taste buds last week with a photo of Sweet Potato Fries seasoned with Lime Salt & Fresh Mint with a Sweet and Spicy Dipping Sauce on the side. It sounded like it was right up my street. Fresh Mint. Alas I had finished the last of it a couple of days earlier. I did have some Sweet Chilli sauce to which I added a teaspoon of honey and a dash from my ever open vermouth. So I set to work. 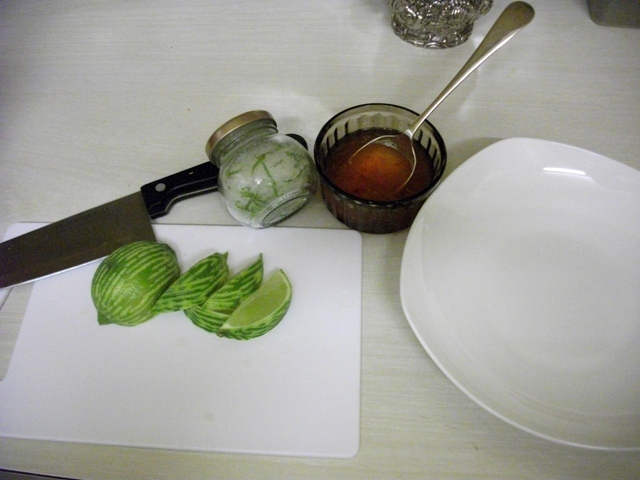 First I zested a lime and found a small screw top jar for salt and zest. I gave them a shake and left it to work the magic. 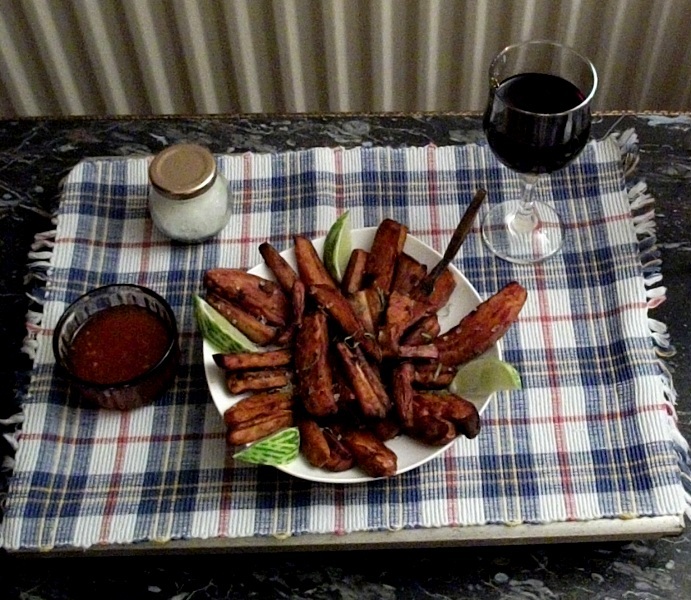 Later I scrubbed some sweet potatoes and parsnips (my own touch) and cut them into chunky chips. My starter to enjoy by the fire! Remove the stalks from the spinach, wash and then dry in a salad spinner. Heat the butter and oil in a large frying pan with the pancetta, garlic and walnuts. Cook until the pancetta is crisp, garlic golden and the nuts are toasted. Add the spinach, lemon juice and lemon rind to the pan. Cook the spinach for 2 minutes over high heat , stirring all the time. A moist fruitcake that keeps well in a tin, ideal to share with unexpected visitors over a warm cup of tea or coffee. Place the first five ingredients in a pan and heat slowly stirring until the sugar has melted. Bring just up to almost boiling point, reduce heat and simmer for a few minutes. Allow to cool, then add the beaten eggs and the flour and mix to combine then stir in the whiskey. Pour into a greased and lined 8-inch cake tin and level the cake mixture. Bake in a preheated oven for approx 1½ hours. Allow cake to cool in the tin, and then store in an air tight tin or the freezer. Melt butter in the water and bring to a rolling boil. Remove from the heat and add the flour at once. Beat with a wooden spoon until the paste is smooth and comes away from the sides of the pan cleanly. Remove the dough from the pan and place in a bowl to cool slightly then beat in the eggs gradually, adding just enough to give a smooth mixture of piping consistency. Pipe onto greased baking sheets in small buns about 5cm/2in in diameter leaving at least an inch between each bun.. Bake for 20-25 mins, until puffed, golden and crisp. Allow to cool on a cooling rack, make a small slit in each for steam to escape. Fill with Whipped cream, arrange the profiteroles on a plate and drizzle with chocolate sauce over the top. Chop the Mars bars and melt together with milk in a bowl set over a pan of gently simmering water, stirring all the time (the water shouldn’t touch the bottom of the bowl). Pour over Profiteroles while still hot. Ever try a savoury version? They work just as well and makes a great appetiser. Sprinkle the top of the buns with favourite chopped herbs, ground spices or grated cheese before putting in the oven to bake. Now I wonder…… would Hummus work? 1 egg – white only. Mix Rhubarb, icing Sugar, yoghurt & cinnamon together. Coat the chops in seasoned flour. Heat enough oil in a large frying pan to cover the base. Fry the meat quickly on either side until well- browned. Drain and place the chops in a single layer in a shallow casserole. Remove the rind and all traces of white pith from the oranges. Slice, discarding any pips, and cut each slice in half; sprinkle with 2 tablespoons of sugar. Blend the cornflour with a little wine; add the remainder of the wine and the orange juice and sugar. Bring to the boil, stirring, and pour over the chops. Arrange the sliced onion over the chops, cover tightly and cook in the oven for 1½ hours. Remove the lid; arrange the orange slices over the onion and cook for a further 15- 20 minutes, basting occasionally. Before serving, reduce the liquor, if you wish by boiling, then adjust the seasoning and garnish with watercress. Serve with medley of vegetables and boiled spuds.